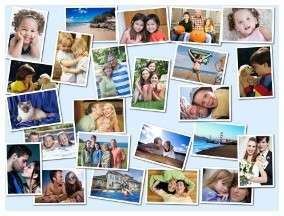 Create Photo Collage Puzzle online - up to 2000 pieces Too many great photos and you would like to use them all? If your are not able to decide which photo you would like to turn into puzzle, you can always create a photo montage directly on our website and select from many different templates and themes. Customize your gift even more by adding backgrounds and clip arts. The photo collage is also a great solution for lower quality images.